Many people wonder what to do when they have too much bread. Of course you can turn it into other things: croutons, breadcrumbs, gazpacho, bread pudding, apple charlotte...or if you really cannot be bothered to do any more cooking, you can freeze it. Bread freezes beautifully. 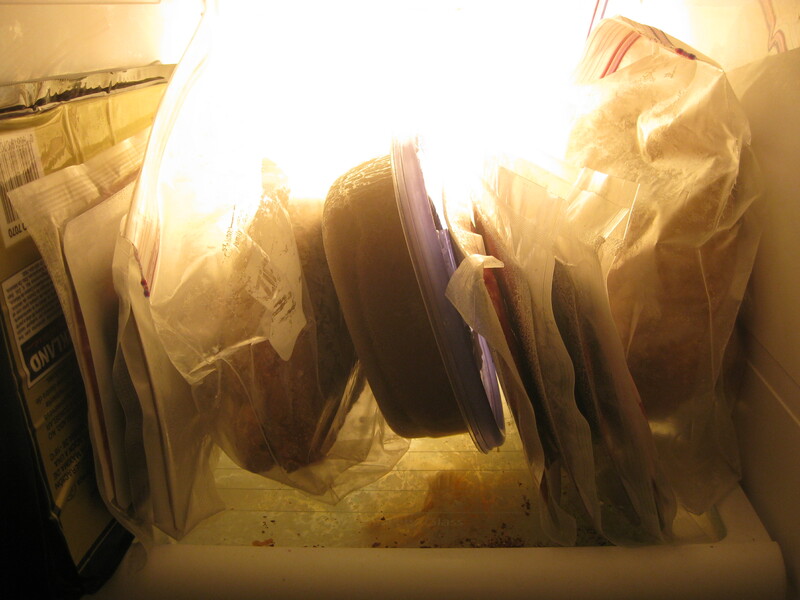 Simply wrap it in wax paper (greaseproof paper) if you have any and put it into a zip lock bag (or a plain plastic bag will do) and pop it in the freezer. In fact, because bread freezes so well, it's a reason to make 4-6 loaves at a time (or however many fit into your oven) so that you turn on your oven once, fill the freezer, and don't need to bake again for a while. 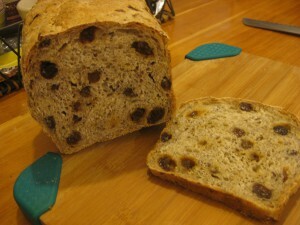 Today I took some raisin and cinnamon bread out of the freezer in honour of my parents' visit. 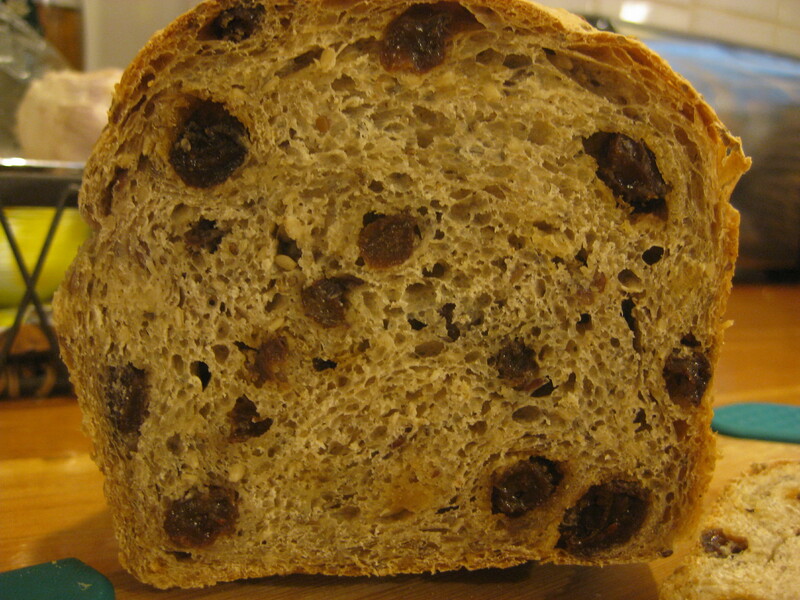 My father adores raisin bread (white, raisin bread) and it is something that my mother (the German, remember?) thinks is - well - just a bit odd. 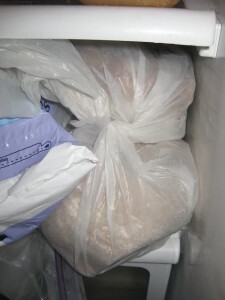 So, I made some a while ago and popped it in the freezer and it was declared, "excellent - wonderful texture." 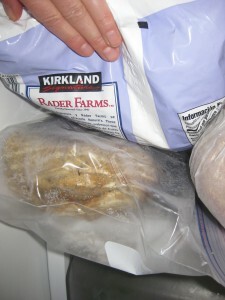 Without further ado, an easy recipe for raisin bread that freezes beautifully so you may as well double, triple, or quadruple it. If you are using instant or fresh yeast measure all the ingredients (except the raisins) into a bowl and mix to blend thoroughly. If you are using dry yeast, measure the flour into the bowl and make a well. Measure in the yeast and pour enough of the water on to fill the well. Let it sit for 10-15 minutes to let the yeast dissolve. A beige sludge may or may not form on the top of the water. Don't worry about it, the main thing is to dissolve the yeast. Add the rest of the ingredients except the raisins and mix to blend. Click here to see a video on how to proof dry yeast. Turn the dough out on the counter and knead well for 10 minutes. Put it back in the bowl and cover. Let it rest for 20 minutes or so. Drain the raisins and then dump them on top of the dough. Using your hands gently fold in the raisins. Don't worry about the dough - it will recover. Worry about not squashing the raisins into little brown smears. Cover the dough and let it rise until it has doubled in size. This will take 1-2 hours depending on how warm your kitchen it. Using a hard fat (butter or lard) grease a bread tin. Remove the dough gently and shape it into tight sausages. Click here to see a video on how to do this. Cover again and let rise 45 minutes - 1 hour. Again, it will double in size. Pre heat the oven to 200 degrees C. Pop the dough in and bake for 45 minutes. Remove and let cool completely on a wire rack. If you would like to learn more about baking bread, take a class with us! We have plenty of excellent classes for beginners and more advanced bakers alike!